Inventory managers walk a fine line between having too little to service demands to having too much that affects the holding cost. The problems are especially visible in the Aviation Industry where the cost of the spares often changes with the urgency of its demands. This may result in large inventory levels to retain high fill rate with negative effects on the balance sheet or in outages which result in grounded aircraft. 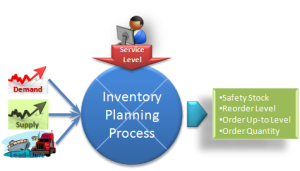 BravoMike has supply chain and inventory specialists who will work with your supply chain group to design an inventory planning process and stocking model that optimizes inventory to achieve required fill rates. We will study the data of demand rates and lead times and region wise holding to help you balance your incoming inventory with the outflow. Results – low capital requirements, less inventory on shelves while achieving a higher fill rate.